Gemma lives in a smallish Colorado Mountain town – but still big enough to have some skiing and some cultural life – and her life is complicated. Like a real person’s life is complicated. She has beloved grandparents who raised her, but her grandmother suffers from dementia; she has a baby she loves and is engaged to the baby’s father, but she’s conflicted about him because of a past affair; and her relationship with her partner, Finn, can be prickly. Oh, and the police department is dealing with a leaker. The book focuses on two story threads. One involves a woman who has disappeared while out camping with her friends on the shore of the remote Lost Lake; and the other, a dead museum director, is found strangled in her office the night after a gala. This is a pretty traditional set up and Littlejohn is extremely deft working within the confines of genre protocol. She is really good at creating a mystery with not a ton of characters and making the reader doubt each – or at least several of them – in turn, which is an absolutely golden age skill. What’s updated about her books is the character development. Gemma is so three dimensional, so fleshed out, and still, as a reader, you feel like there’s more to find out about her. What’s a better mystery than that? In all three of these novels the prose itself is lovely, crisp, evocative, and memorable. 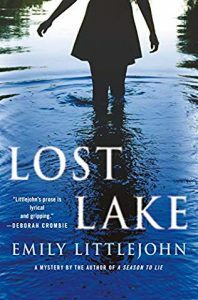 In the first two there was an element of a case in the past that’s almost mythic and this novel is no different, as the “Girls of Lost Lake” are referenced. They were a group of young girls who all died tragically in the Lake many years in the past. In the first two books, the mythic parts of the stories were a larger element and my only caveat with this excellent novel was that the “Lost Lake Girls” weren’t a bigger element in this story. That said, I’ve read few better plotted mysteries this year, and I loved the look at the many suspects Gemma and Finn track down. I could not stop reading.